David works in construction and is a contractor. He also manages the band, Drew Nugent & the Midnight Society. He has about thirty-five (35) hours of work done on his body, and he explained that these are traditional pieces on his hands. He was inspired to have his knuckles read "True Blue" as they speak to his belief that our country has lost its values that need to be regained. Key among these values are loyalty and honor, in the traditional, "true blue" sense of the words. To him, the panther represents that we need to fight to regain these ideals. And the two roses represent the ideal (the healthy, red flower on the right hand) and what he called the "diminished," (on the left) that is, where we're headed with our loss of values. David embraced these traditional elements because he feels that "the only way to have a future is to look at the past". He had the panther done at a tattoo convention. 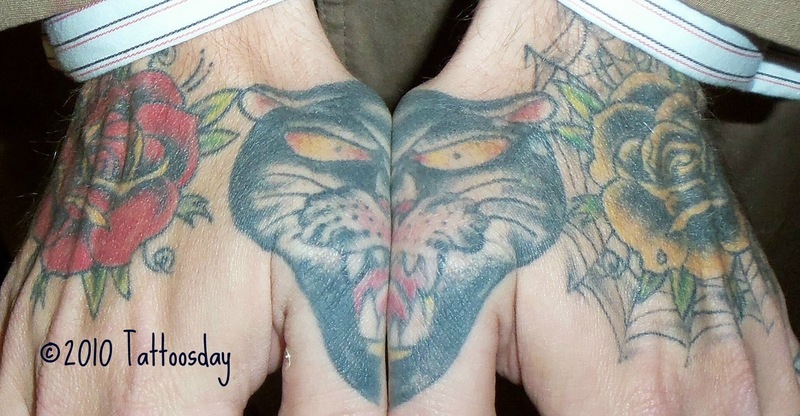 The roses and "TRUE BLUE" knuckles are credited to Rick Meggison at Marked 4 Life in York, Pennsylvania. Thanks to David for sharing these very cool hand tattoos with us here on Tattoosday!